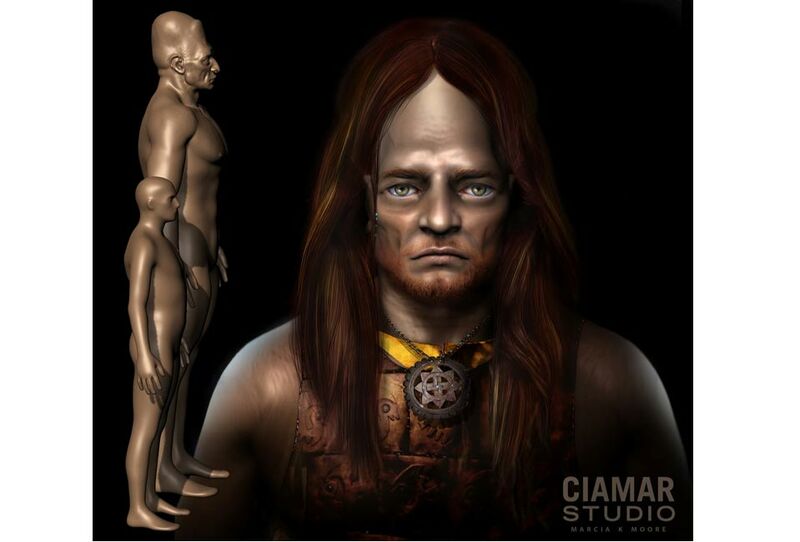 Featured image: 3d Digital Sculpture of Giant with hair, copper breastplate, and gorget. Image courtesy of Marcia K. Moore, Ciamar Studio. For more reconstructions of giants, visit Marcia K. Moore’s website. Artist’s reconstruction of the high skull vaults reported in descriptions of North American giants. Image courtesy of Marcia K. Moore, Ciamar Studio. “One of the particular features present in at least one-half of the observed examples is the great width of the bony chin, formed by bilateral eminences rarely found among the skulls of the much earlier Shell Heap People or among the later Hopewell People.” (The Adena People, No 2, by Webb and Baby). “This individual was of large proportions. When measured in the tomb his length was approximately 7.04 feet. All the long bones were heavy and possessed marked eminences for the attachment of muscles.” (Mounds for the Dead, by Don Dragoo, 1963). “Two outstanding traits have been noted repeatedly for this group. One is the protruding and massive chin often with prominent bilateral protrusions. The second trait is the large size of many of the males and some of the females. A male of six feet was common and some individuals approaching seven feet in height have been found, for example, Burial 40 in the Dover Mound and Burial 54 in the Cresap Mound. Some of the females in the Dover Mound also were more than six feet in height. Not only were these Adena people tall but also the massiveness of the bones indicates powerfully built individuals. The head was generally big with a large cranial capacity”. (Mounds for the Dead, by Don Dragoo, 1963). “If, as the evidence seems to indicate, the burials in the tombs were those of a selected group such factors would have undoubtedly been of importance not only in the development of the prominent chin but also in the large stature. If only certain inbreeding individuals of the total population were members of the ‘selected group’, genetic factors would also have played an important part in the establishment of the unique Adena physical type…How wide-spread throughout the entire Adena population were the unique traits of the tomb burials is unknown but Snow’s study of the cremated remains from the Dover Mound indicated that at least some of the individuals among these cremated remains also possessed the unique traits of the flesh burials in the tombs. Because of the common practice of cremating most of the dead, we will probably never be able to determine the full extent of these special traits in the general population.” (Mounds for the Dead, by Don Dragoo, 1963). The emerging picture is of an elite race within Late Archaic/Early Woodland societies who were often buried in the mounds, and who represented a type of “royalty”. Among these interrelated groups were UPTs. This elitism is further evidenced by the presence of extensive child and infant burials in the tombs, often accompanied by the same exotic goods as the adults including shell beads and copper rings. Also, dental and bone anomalies have been used to establish a genetic connection between individuals at mound sites. Following the discovery of burials in her own flower garden, Murray embarked on an archaeological odyssey of her own. In 1921, she published an article for the American Anthropologist, noting that the femur, jaw, and teeth of one of the seven-foot skeletons was then still in the Tioga Point Museum. Also included are references to many skeletons between 6 and 7 feet tall, with photographs of artifacts, pottery, and the in situ burial of one of the “above 6ft” burials. The article also features a photograph of the “Paul Scott Collection”, described as “a multiplicity of small artifacts, suggesting a race of pygmies” which included a “miniature amulet and sinker stones.” (Aboriginal Sites In And Near “Teaoga”, in American Anthropologist 23(2) 1921). While the concept of a mysterious and undiscovered race may create an air of sensationalism healthy for selling books and DVDs, we feel that it is of far more relevance to demonstrate that the Unique Physical Types were discovered by professionals all the way up through the 20th century, even after the institutionalized policy of denial, and yet the establishment continues to deny their own documented evidence and the truth. Featured image: Illustration from “Mundus subterraneus” – suggesting that fossil bones were from giants (Wikimedia Commons).